High blood pressure or hypertension is a condition when your blood pressure increase to unhealthy levels. When the arteries become narrow, your blood pressure increase. If the blood pressure remains high for a long period, it may lead to other serious problems or disease. 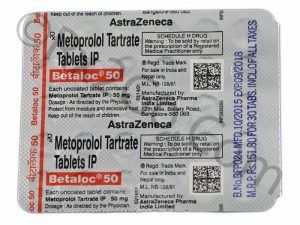 Metoprolol Tartrate is used to treat angina (chest pain) and hypertension. Metoprolol belongs to the class of drugs called as beta – blockers. They prevent a natural chemical (adrenalin) from acting on beta receptors in blood vessels and in the heart. Thus blood vessels relax. This results in smooth flow of blood and oxygen supply to the heart. The drug helps to lower blood pressure. It also helps to reduce chest pain as the muscles relax. The drug reduces the strain on the heart by lowering heart rate and hearts demand for oxygen. How to take Metoprolol Tartrate? Metoprolol Tartrate is available in the form of a capsule. The strengths are 25 mg, 50 mg, and 100 mg. Take the capsule with or after a meal. Adult Starting dose – 100 mg in a single or divided doses. Effective dose – 100-450 mg per day. Maximum dose – 450 mg per day. Children: – No pediatric studies have been performed. The response of the patient to the first dose. Your doctor may adjust or increase the dose at a periodic interval, depending on your condition. What are the uses of Metoprolol Tartrate? Metoprolol Tartrate treats high blood pressure (hypertension). It is used in the treatment of chest pain (angina). Improves survival after a heart attack. It can be used alone or with other medication for better effect. Lowering blood pressure helps to prevent stroke, heart attack, and kidney problems. It lowers the heart rate, blood pressure and strain on the heart. It is also used to prevent a heart attack. It may be used for other purposes not listed in medication guide. What are the precautions in taking Metoprolol Tartrate? Certain conditions may limit the use of Metoprolol Tartrate. Inform or ask your doctor if you have/are. · A serious heart problem (heart block, slow heart rate). Use of the above drug in pregnancy and breastfeeding is unknown. The drug is not recommended to use in a patient younger than 18 years old. Tell your doctor regarding all other medications you take. This may avoid drug interaction. Generic medicines are cheap as compared to the brand ones. They contain the same active ingredient. The effect of both the drugs is same. The Generic medicines do not have to spend much on packaging and pricing. They don’t undergo research and development. This helps us to sell cheap and effective medicines. Cost of Generic Metoprolol Tartrate. 60 caps 25 mg $ 25 $ 0.42. 60 caps 50 mg $ 33 $ 0.55. 60 caps 100 mg $ 49 $ 0.82. 60 caps 50 mg $ 142.30 $ 2.37. 60 caps 100 mg $ 210.37 $ 3.51.